Sean is a senior lecturer in Theatre Design. He is a year two tutor, module leader, and placement tutor. He teaches across years one to three, running modules in puppetry, object theatre, carnival and opera. He teaches on the Costume Design and Making course and is module leader on the MA in Puppetry and Digital Animation in Visual Communications. He is currently Co-supervisor for a PHD in object theatre and design research, University of Southern Denmark, Faculty of Humanities, The Department of Design and Communication & SDU Design Research. Creative consultant and performer. Before the Dawn, 2014 [concert], Kate Bush/The KT Fellowship, London. Puppet maker, performer, designer. Salt, 2014. [short film]. Directed by Maria LLOYD. Co-production between Medieoperatørene, Aurora Films, Sentrifugal Films, and Pleasnar & Krauss Films. Puppetry and object theatre consultant. Inside Out of Mind, Meeting Ground Theatre Company, 2013 [play]. Directed by Tanya Myers. Puppet Captain. Olympic Opening Ceremony, 2012. Directed by Danny Boyle. The London Organising Committee of the Olympic and Paralympic Games, London. Puppetry Consultant. Cinderella’s Sisters. Red Earth Theatre Company, 2008. Designer/Performer. Play Antarctica, Unicorn Theatre. 2005. Puppetry and object theatre consultant. A Fine Balance by Rohinton Mistry, Tamasha Theatre, London, 2004. Performer. International tour of Forget me Not, Compagnie Philippe Genty (France), 1991-95. Workshop Facilitator. The Art of Omission, The International Festival of Theatre, Hong-Kong, 1993, Chicago International Theatre Festival, USA, 1993, Sadler’s Wells Theatre, 1993, Trinity College, Samuel Beckett Centre, Dublin, 1993. Workshop Facilitator. The Homecoming, Alliance Francais commission, Refugee Camp, Posoje, Bosnia, 1992. Creator and Performer. The Mexican Love Tragedy (object theatre play), UK tour, 1990. Performer and Designer. Norwich Puppet Theatre, 1987-89. Sean was the principal-investigator on an AHRC Research Network project, ‘Foundations for Object Theatre’, which created network opportunities for debate about emerging understandings of ‘Object Theatre’ in order to initiate a research agenda to establish object theatre as a separate discipline. Its focus was to explore its interdisciplinary history, clarify its methodology, and identify fruitful research questions and teaching methods. Sean freelances as a consultant in puppetry and object theatre for performance, and has presented papers at the Wellcome Trust and international puppet festivals. He curated object theatre workshops for the Prague Quadrennial 2011 and the World Stage Design, Cardiff, 2013. His practice-based research includes running workshops for postgraduate students at SDU Design, University of Southern Denmark; facilitating workshops for Meeting Ground to train healthcare assistants; and performing, consulting and directing on productions including Before the Dawn, 2014, Kate Bush/The KT Fellowship, London. In his research, Sean found that teachers, students and practitioners are not always aware of or using the entire range of approaches and techniques, e.g. there can be too much emphasis on giving the object human characterisations, rather than working with the object's material attributes and meanings. 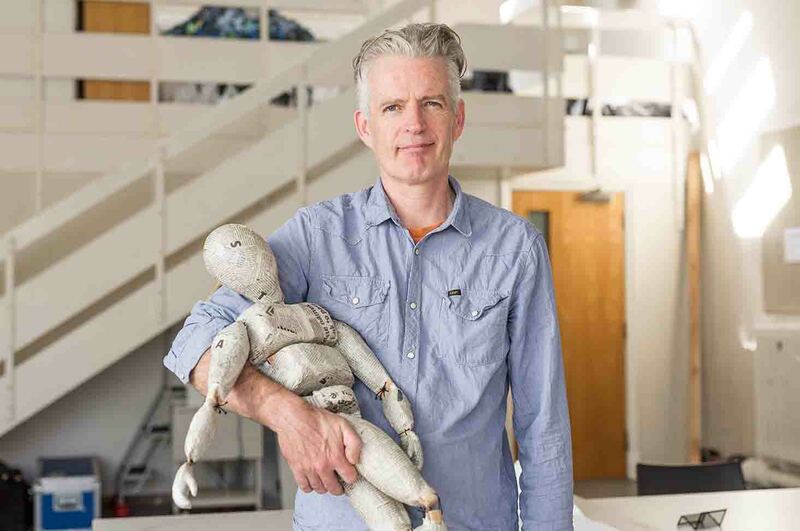 His research aims to broaden current understandings of object theatre for teachers, students, and those without specialist knowledge, as well as for object theatre professionals who are interested in exploring and debating alternative approaches and techniques. To establish a foundation for object theatre as a separate discipline. Puppetry and Object Theatre: commonalities and differences. To develop a schema of approaches and techniques that can be used in the research, pedagogy and performance of object theatre. Documenting the practice of practitioners from diverse cultural backgrounds to broaden both the definition of object theatre and its methodology. Practice-based research into the use of object theatre in other arts disciplines. Practice-based research into how object theatre methods can be used in contexts outside of performance such as service systems, product design, training, and health and wellbeing. Other areas of interest and research include: Puppetry, Traditional and Post-modern; and Sustainable Theatre Development in practice and teaching. Invited reviewer, Routledge and Palgrave Macmillan. Bid consultant/consultant/organiser, Nottingham Puppet Festival 2018, 2017 to March 2018. Member of Advisory Board, Curious School of Puppetry, London, 2015 to present. Member (invited), Puppetry development Consortium (funded by Arts Council England and managed by Puppet Centre Trust), partnership of puppetry leaders working collaboratively on strategies and initiatives to raise the profile of UK puppetry, 2015 to present. Board Member (co-opted), Norwich Puppet Theatre, 2008 to present. Bid consultant/consultant /organiser, Nottingham Puppet Festival 2018, 2017 to present. Puppetry Consultant and Workshop Coordinator on the development of new writing for puppetry, Imagine Project (using the arts to enrich the lives of older care home residents), City Arts, Nottingham, 2017. Teaching and research, Erasmus+ staff mobility,SDU Design, University of Southern Denmark, Kolding, 2017. Object Theatre Masterclasses, Winter Academy, HKU University of the Arts, Utrecht, 2014. Object Theatre Workshop Facilitator,Inside Out Learning Event for healthcare assistants, 2013. Curator, 2013. Puppetry Workshops/Presentations, World Stage Design 2013, Cardiff, 2013. Curator, 2011, Puppetry and Object Theatre Workshops, Scenofest 2011, Prague Quadrennial, 2011. AHRC Research Network Grant. £34,339. Principal Investigator, Sean Myatt, Nottingham Trent University. 2011/2012. SPUR (Scholarship Projects for Undergraduate Researchers). £1,640, for The Sustainable Theatres/Design and Production Practices Research Group, headed by Sean Myatt, 2011. Pedagogic Research and/or Development Projects, NTU. £850, for setting up a Materials Library, 2010. CETT (The Centre for Excellence in Training for Theatre) Grant. £5,000, for an Object Theatre website, 2009. Arts Council and John Wright Bursary. £5000, 1989. MYATT, S. and WATT, D.P., 2012. From Frozen Sponges to Plastic Bags: Object Theatre - A Developing Network, Puppet Notebook, 22, pp.19-22. MYATT, S., 2009. Object Ramblings. In: Theatre Materials: What is Theatre Made Of, ed. Eleanor Margolies. CETT. MYATT, S., 2014. Sustainability in Theatre Design Teaching. In: Sustainability in Theatre Symposium, London, July 2014. MYATT, S. and WATT, D., 2014. Objects and Performance. In: Primary, Nottingham, May 2014. MYATT, S., 2013. Object Theatre: A developing Network. In: Performing Objects Conference. Falmouth University, October 2013. MYATT, S., 2012. Object (if) ication: Objects of Emotion. In: Objects of Emotion Symposium, Wellcome Trust, London. July 2012. MYATT, S., 2012. Performing Objects. In: Object Theatre Symposium and Exhibition. Radar Arts in collaboration with Loughborough University, Loughborough, March 2012. MYATT, S., 2011. Instinctive Object Ramblings. In: Puppetry and Post Dramatic Performance Conference: an international conference on performing objects in the 21st century, University of Connecticut, Stores, USA, April 2011. MYATT, S., 2010. Teaching Puppetry in Higher Education. In: Puppetry Heritage and Teaching Symposium, Hett Firmament, Mechelen, Belgium, March 2010. MYATT, S., 2008. Instinctive Object Ramblings. In: Theatre Materials/ Material Theatres Conference, Centre for Excellence in Training for Theatre, The Central School of Speech and Drama, London, April 2008. MYATT, S., 2006. Instinctive Object Ramblings. In: Scenography Working Group, Theatre and Performance Research Association Conference (TAPRA), University of Glamorgan, 2006. MYATT, S., 2006. The Talking chair. Since 1843: In the Making, Nottingham Trent University Art and Design Alumni Exhibition. Jan 2014. MYATT, S., 2006. Culture. Wanderlust, Bonnington Gallery, Nottingham Trent University, Jan 2011.